Blackman, Allen and Ping Qin. 2018. “How Costly are License Plate-Based Driving Restrictions? Contingent Valuation Evidence from Beijing.” EfD Discussion Paper Series 18-18. A common policy response to severe air pollution and traffic congestion in developing country megacities is to ban the driving of vehicles with license plates ending in certain numbers on certain days. 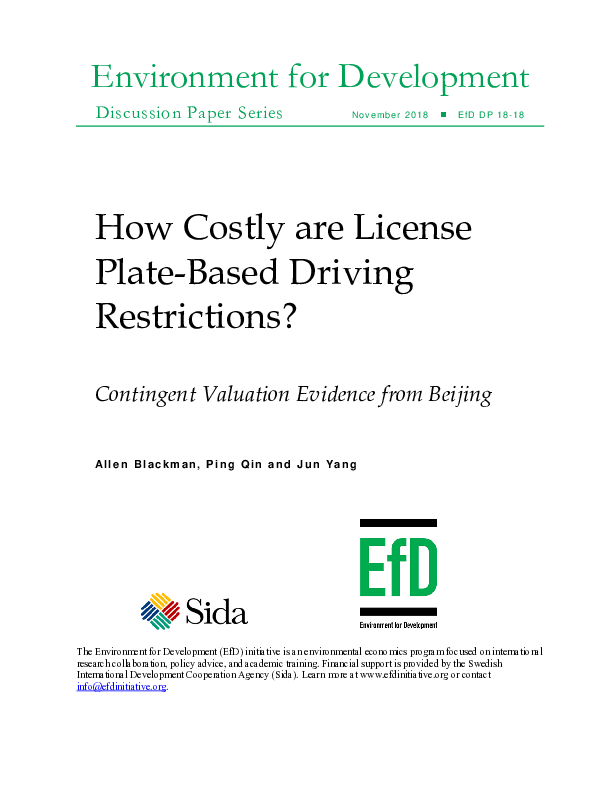 We use the contingent valuation method to estimate the costs to drivers of Beijing’s driving restrictions program, one of the world’s largest. Our study generates three main findings. First, costs are significant: RMB 353 to 708 (US$53 to $107) per driver per year, which represents 0.5 to 1 percent of annual income, and RMB 1.6 billion to 3.3 billion (US $245 million to $493 million) per year for all drivers. Second, available evidence suggests that the benefits of the program are well above the costs. Finally, the costs per driver are significantly smaller than the costs of Mexico City’s program (estimated using the same method), which by most accounts has had zero or negative benefits. These findings provide some of the strongest evidence to date that driving restrictions programs can have net benefits. They also suggest that relatively high program costs are not a necessary condition for significant program benefits—in fact, the opposite may be true.